Normally, when Google creates doodles, it uses its brains to create art that everyone can grasp and feel. For tomorrow in the U.S. (and today in places like New Zealand), however, the company has decided to offer no such creative mercies. June 23, 2012 would have been the 100th birthday of Alan Turing. And you can hardly celebrate his memory with something fluffy and brightly colored. Instead, there are a series of 1s and 0s and arrows pointing to left and right. 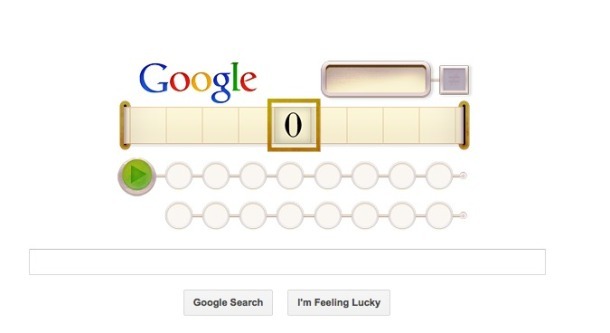 Turing was an exceptionally gifted mathematician, computer scientist and code breaker, whose Turing Machine (which this doodle commemorates) was the basis for so much in computing. In an act of utter disgrace, for which the British government only apologized in 2009, Turing was prosecuted for homosexuality in 1952. He was chemically castrated and died in 1954 (aged 41) after biting into an apple laced with cyanide. At the time, an inquest declared this to be suicide. However, some believe his death was an accident. This was the man who had helped crack the German Enigma code, a great step toward bringing a successful end to World War II. In return, he was prosecuted for gross indecency and given the choice of prison or experimental chemical castration. While Mr. Turing was dealt with under the law of the time and we can't put the clock back, his treatment was of course utterly unfair and I am pleased to have the chance to say how deeply sorry I and we all are for what happened to him. His conviction was never overturned, this despite efforts in 2011. The British government declared that he was legally convicted at the time, and therefore wouldn't make an exception. It did, however, make an exception for 300 World War I deserters in 2006. The reason for many of their desertions had been given as shell shock. British Member of Parliament John Leech has long tried to get the same kind of pardon for Turing. Turing's work was so widespread that his influence infused so much of modern thinking. In 1950, for example, he created a test -- now known as the Turing Test -- that measured the intelligence of a machine. He is credited with having designed the circuitry for early computers by himself. Turing's Pilot Ace computer was the one that, in 1954, worked out the cause of a mid-air explosion aboard a Comet jet. London's Science Museum is this week opening a year-long exhibition called "Codebreaker: Alan Turing's Life and Legacy" (see video above). It includes a German Engima coding machine on loan from Mick Jagger. As for Google's commemorative doodle, I have embedded a video showing how to solve it. Just so that you can be a codebreaker for a day.